Dr. Marilyn Dossett Sesser Bowen was born September 5, 1951, in Natchez, Miss., to Clarence Edward Dossett and Kathryn Maudell Dossett. She always joked that she was born premature thanks to her mother’s steady pregnancy diet of cigarettes and Coke. Marilyn was born weighing 5 pounds 3 ounces, and lost down to 3 pounds before being nursed back to health. She was born a survivor, and that fighting spirit stayed with her throughout her life. Her childhood in Natchez was spent enjoying time with her family, including her siblings, Sammy, Bobby and Judy. Her interests always revolved around music and friends, and she was lucky to grow up in a time of social change. Marilyn tried to spend her life showing others how to love one another, no matter their differences. Marilyn graduated in 1969 from Natchez High School, where she was a member of the Symphonic Band, Future Nurses Club, Sophomore Class Secretary-Treasurer, Senior Class Student Council Treasurer, a member of the Natchez Singers, Sergeant of the Rebelette dancers, and participated in theater and music programs as well. One of her favorite memories was playing Marian Paroo in “The Music Man,” in spring of 1969. She was voted “Wittiest” during her senior year, a trait she would carry with her until the end. Following graduation, she attended Mississippi State University, where she majored in psychology. She participated in the choir, and was a pledge of Alpha Epsilon Pi. She left MSU in 1972 to marry Royce Scott Sesser, of Woodville, Miss., a Marine who had recently returned from the war in Vietnam. She worked at The Diamond Shop in Natchez, when first married. She then returned to school at the University of Southern Mississippi, while pregnant with her first child, Ryan, to pursue a bachelors’ degree in Elementary Education. She would later graduate from USM while pregnant with her second child, Kacy, in 1976. She worked at McLaurin Elementary where she did her practice clinical teaching with first graders. Following this degree, she begin to work toward her master’s degree in Elementary Education, which she obtained in 1978. In 1980, the family moved to Columbus, Miss., where Marilyn was a homemaker who took care of her growing family, which included a third child, Brandon, born that year, and a fourth, Brent, in 1983. 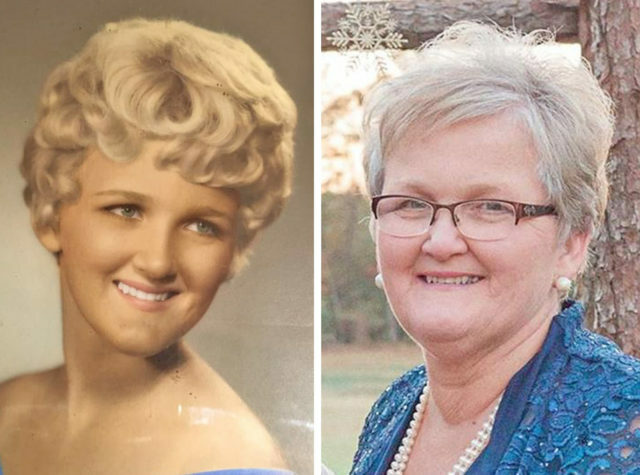 She was an active member of Fairview Baptist Church for many years, where she participated in the choir, helped with the Easter and Christmas celebrations, and led women’s groups and prayer studies. She was a confidant for many throughout her life, and stood on her faith as a way to get through many situations that life handed her, and those she loved. When her youngest son was in elementary school, Marilyn put her education to use, and started substitute teaching. She worked part-time for the Title One office, and went into schools to help students and teachers. Her first full-time position was with Back on Track, an alternative program in Columbus for at-risk youth. She then worked at New Hope Elementary School as their Title One coordinator, and remained at New Hope in various roles until 1998. In June 1998, she married Charles Michael Bowen and moved with her youngest sons to Eupora, Miss. With her new husband, she became a part of the community through work and social interactions. For 20 years, she was happy to call Eupora home, and spent her time raising chickens and was always happy to get outside on the tractor to mow the grass, especially after they later built their dream home. Also in 1998, she began her tenure at Mississippi State University, where she was a teaching assistant, and later professor, as she pursued her Doctor of Philosophy from the College of Education. In 2002, she was awarded her doctorate after writing her thesis on online professional development for teachers. That year she began her work for the Research and Curriculum Unit at MSU, where she did a lot to further enhance the way Mississippi teachers and students would learn. The first program she implemented, Certification of Online Learning (COOL), instructed teachers how to teach online. Now, all teachers in the state of Mississippi must be certified in COOL before receiving their license. In her 14 years of service at the RCU, Marilyn worked with many programs throughout the state, including Canvas, and along with her devoted co-workers, helped advance the teaching curriculum. She participated in and helped lead numerous training sessions at various education conferences across the U.S. and Canada during her time at the RCU. Marilyn was diagnosed with Stage IV colon cancer in 2014, and was blessed to have nearly five more good years with her husband, children and grandchildren. Being a Mimi was the job she cherished most, and this is where she gathered her strength to fight, as she worked for more time to get to know her youngest grandchildren. She was a light for many going through treatments with her, and she shared her strength and caring attitude through multiple surgeries and rounds of chemotherapy and radiation. She is preceded in death by her parents, C.E. Dossett and Maudell Dossett; her siblings, Bobby and Judy; and her former husband, Royce Scott Sesser. Survivors include her husband, Charles Michael Bowen, of Eupora; her children, Ryan Scott Sesser, Kathryn Clare Sesser-Dorné (Hunter), Andrew Brandon Sesser (Amy), and William Brent Sesser; her step-children, Charles Anthony “Toby” Bowen (Natalie), Brooklyn Anne Bowen Matherne (Nick), and Brian Michael Bowen; her grandchildren, Daley Scott Sesser (Madelyn), Brett Michael Bowen, Calie Danielle Bowen, Jacqueline Claire Matherne, Allison Grace Bowen, Rain James Sesser, Archer Royce Dorné, Cooper Michael Bowen and Maisy Lilith Sesser; and one great-grandchild, Sawyer Elise Sesser; her brother, Samuel Edward Dossett (Pam); sister-in-law, Cheryl Randles Dossett; step-mother, Helen Randles Dossett; her former husband’s children, Harli Sesser and Rider Sesser, Sarah Green; her husband’s extended family; and numerous cousins, nieces and nephews, great nephews, and their children. She also leaves behind a multitude of special friends, co-workers and neighbors who will forever hold a piece of her in their heart. Ushers include her sons, Brandon and Brent Sesser; her son-in-law, Hunter Dorné; her stepsons, Toby and Brian Bowen; and her grandsons, Daley Sesser and Brett Bowen. Honorary pallbearers include her nephews; Cancer Care of Starkville patients and staff; oncology surgeon Dr. Phillip Ley and his staff; Dr. Julian Hill and his staff at North Mississippi Medical Center; Dr. Garrett Ogg; and the staff of Dr. Jamie’s Cannon’s office at the University of Alabama Hospital in Birmingham, and all of the nurses, aides and caretakers who watched over her. In the final days of her life, Marilyn was so grateful that God granted her the opportunity to visit with great friends and close family and have the chance to say goodbye. She was so honored and touched to receive the outpouring of love and support in the years she fought cancer. Funeral services will be Sunday, March 3 at 2 p.m. at Wise-Reed Funeral Home in Eupora, Miss. Family will receive friends from noon until the time of service at the funeral home. Her family hopes to establish a scholarship in her name in the near future, so donations can be reserved for that.